One afternoon while taking in the sun, a cow named Clorinda casually notices the flight of a passing barn swallow. "Oh, how I wish I could fly like a bird," thinks Clorinda. So (never mind that a cow never has), Clorinda resolves to be the first and show the world how it's done. 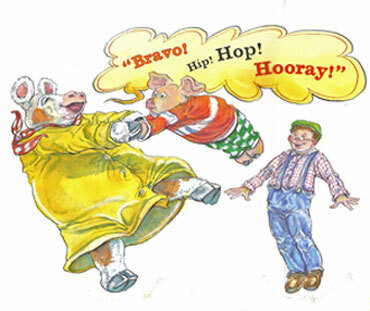 She flatly dismisses the reasoned misgivings of her dear friend Hop and enlists the help of her dear friend Len. One way or another, Clorinda the cow will fly. Sky high! But more important to the intrepid trio than their Lindbergh-like achievement is the warm, sustaining friendship that binds them together. 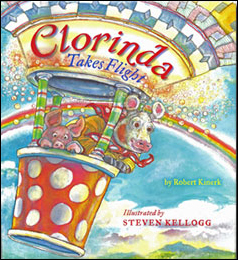 Just as in their first collaboration, Clorinda, Robert Kinerk and Steven Kellogg team up in an adventure that soars above the aspirations of ordinary bovines, Clorinda Takes Flight will inspire picture book readers to follow their dreams, no matter how impossible the quest may seem.